Be stunned with a panoramic view of an ever-growing skyline, a picturesque sea beach and spectacular city by visiting the Dagustu Park. Located in Baku, Azerbaijan, this is a very big park and the highest point in Baku. You can use funicular that will take you to this great spot. Visit during the sunset for an overwhelming view of the boulevard and the Flame Towers particularly during their motion displays. After a peaceful walk, you can also choose to resort to the adjacent famous cafe and restaurants to dine while enjoying the jazz orchestra from famous musicians. Explore Dagustu Park and other prime spots of the city using Baku trip planner. You can enjoy a comfortable stay in the city by booking the best hotels in Baku like Jasmine Hotel Baku, Terrace Hotel and Riva Hotel. Generate executable plans on your own or book the top rated Baku vacation packages for your visit. Read more on how to reach Baku. Love this? Explore the entire list of places to visit in Baku before you plan your trip. Fancy a good night's sleep after a tiring day? Check out where to stay in Baku and book an accommodation of your choice. Great view of the whole city great at night. Eternal flames are a always lit up. Wear clothes to protect from windy weather. A very chilly evening in February. Great view of all popular sights of the city. Flame towers changing colours every few minutes. Different combination of colour scheme. Baku eye, main promenade streets and other all attractions seen well lit at night. Steps to be closed as well. Near train station. Upland or highland park is the best place to visit in Baku. 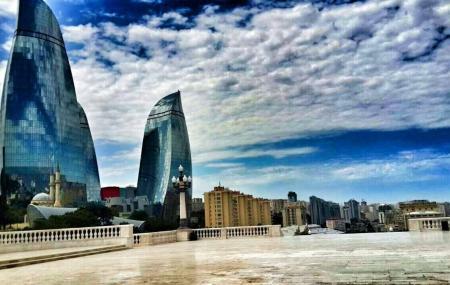 Form there one can have the Panoramic view of Baku and the famous flame towers. The monument is also located there. From observation deck, beautiful view of Baku can be experienced during day time and night time as well as it is peak point of Baku. Fantastic panoramic view of Baku. Visit at night.